Bob and Carrie DiCarlo reside in Canandaigua, New York, with their 2 children: Nora (7) and Ian (5). Bob is a non-family partner with John Knopf at Fa-Ba Farm. They milk 500 Holsteins and raise 390 heifers. The farm grows its own forages and purchases its grain. They are members of Upstate Niagara Cooperative. 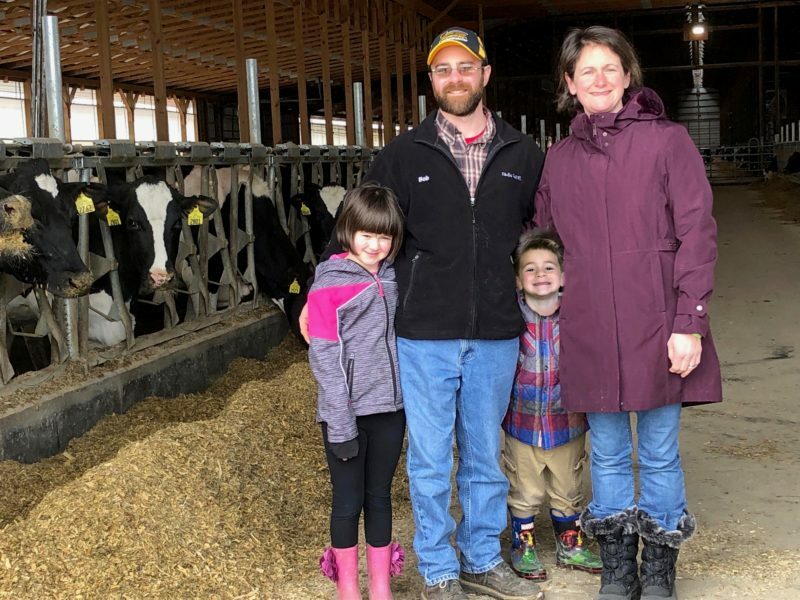 What do you like the most – and the least – about working as a dairy farmer? The thing I like most about farming is being able to work with a good team that is constantly working to achieve excellent care of the cows and the land resources which we have been provided. Seeing the quality product that results from this hard work is very satisfying. The thing I like least about dairy farming is the constant struggle with things that are out of our control such as weather and market prices. Describe how the work on the farm is shared or divided up in your family? Carrie works off the farm as a small animal veterinarian. She also cares for our 2 children and our home. Even when both spouses are not working on the farm it takes a strong commitment from both for the farm and relationship to be successful. On the farm I manage the daily operations and people while John has been able to shift his focus to finances and crops. John is also involved in some off-farm leadership roles. How do you think your farm’s business plan will change 10 years from now? Over the next 10 years I think our business plan will be focused less on growth and more on getting into the strongest financial position possible to be able to take advantage of any opportunities that could help improve the efficiency and future competitiveness of our farm. During those days when things aren’t going well, what do you do to keep a positive attitude? When things are not going well I try to focus on what needs to be done to fix the problem and also on the big picture. Recognizing that you not in control of everything is a big help too, sometimes the outcome that we want is not what is meant to be. We must accept that and have faith that it will work out in the end. What would you be doing if you were not a dairy farmer? Possibly something with wildlife management, I am an avid hunter and fisherman.